For users of the Congressional Basic subscription service. What is searched from the Basic Search form? What is the Congressional Basic subscription? The Congressional basic subscription also covers bill tracking & profiles, bill text, members and committee coverage, the Daily Congressional Record and the Code of Federal Regulations and Federal Register, and political news. 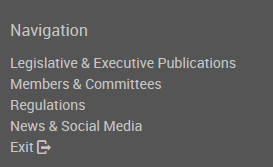 The Congressional basic subscription has abstracts and indexing to all publications and it includes links to an unofficial full text or third-party transcription version of many congressional publications, and the full text of key regulatory and statutory resources. The Congressional digital modules (and the fiche collections) offer a comprehensive collection of the official publications in addition to the abstracts and indexing. The optional Historical Indexes includes indexes for published hearings, committee prints, and Serial Set content from 1789-1969, as well as indexes for all never-published hearings that have been released by the National Archives and indexed by CIS staff. The United States Statutes at Large is an optional module in Congressional Basic. Commonly referred to as the Statutes at Large, this is the official source for the laws and resolutions passed by Congress. Every law, public and private, ever enacted by the Congress is published in the Statutes at Large in order of the date of its passage. Until 1948, all treaties and international agreements approved by the Senate were also published in the set. Use ProQuest Congressional Basic to find committee hearing transcripts, press releases, speeches, press briefings, and more. Use ProQuest Congressional Basic to look at vote reports on bills to see trends and high-level overviews, as well as vote details by member, and more! New visualizations enable quick analysis. Use the Basic Search form to retrieve Congressional information by performing searches on congressional publications, including bills, laws and legislative histories. Basic Search now searches the full text of bills, laws, bill tracking reports, and legislative histories, and searches the abstracts, titles, indexing information, and other bibliographic data for Congressional publications. The type-ahead in this and all search forms is based upon our Subject Index thesaurus, not what other researchers have entered. You may now retrieve an unlimited number of results. Use the Advanced Search menu to search within specific publication types, and perform fielded searches of specific metadata, including document titles, authors, or Congressional source, and where available online (coverage dates vary), search the full text transcripts of documents that have been abstracted and indexed by CIS editors, such as committee hearings, House & Senate Reports and Documents. Use the Search by Number form to search by legislative or bibliographic citations, such as document, bill, law, public law number, or SuDocs number to find specific publications and/or publications related to that legislation. All webinars listed in US eastern time. Click here for a listing of all webinars for ProQuest Congressional, Legislative Insight, Regulatory Insight, and Supreme Court Insight.